Try as you might, it's going to be extremely tough to show children a Lego phallus in Lego Universe. Lego Universe is an MMO where players collect various types of bricks as they complete quests and defeat enemies. Those bricks can then be used to create anything the player wants, just as they would with Lego pieces in the real world. Let's think about this: a kid-friendly MMO, and players able to create anything they want and show it to other players. See the problem? It'd only be a matter of time before NetDevil were attacked by parents whose children had been shown Lego genitalia if proper protections weren't put in place. Luckily, NetDevil wasn't born yesterday and knows the ways of online players and their phallic obsession. MTV Multiplayer has the details on how NetDevil has implemented some seriously deep levels of protection to avoid trouble of this sort. First of all, every created object (and player name) has to be approved before it's displayed to other players. Until NetDevil takes a look, these things remain hidden. Friends can see other friends' creations, but becoming friends isn't as easy as it is in other MMOs. People constantly complain about Wii friend codes and how uncharacteristically unfriendly they are, and NetDevil's "friending" system works in a similar way to keep kids safe. 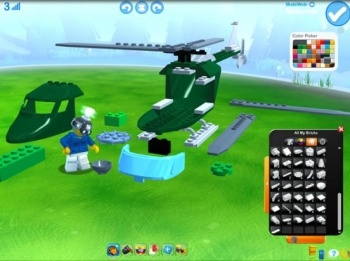 Players must share their "Lego IDs" outside of the game's world and invite each other to become friends. There is no in-game notification at all. Parents can even totally block this system and freeze Lego Universe into only showing their kids pre-approved objects. Not that it'll matter in the long run, because if someone on the internet wants to show someone else something terrible, it's going to happen no matter what. Players will probably just assemble pre-approved objects into the shape of a phallus instead. However, kudos should go to NetDevil for making a Herculean effort here, and I hope it's successful. Edit: Lego Universe is under development by NetDevil, not Funcom as previously reported.